This is simple and small portable water level/water droplet identification, detection sensor water that have high cost performance. Complete water yield and analog conversion, the output value apply to your custom function. It is low power consumption and high sensitivity. 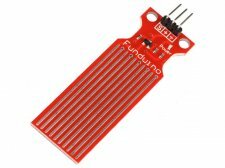 It can make better performance with Arduino 328 controller and sensor relay shield.